Final version. 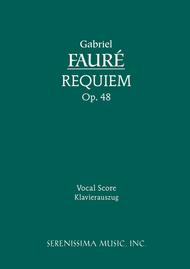 Composed by Gabriel Faure (1845-1924). Arranged by Jean Roger-Ducasse. This edition: Paperback. Mass, Liturgical, Choral, Original Works, Transcriptions. Romantic Period; Sacred/Hymns, French, Funerals. Large Vocal Score. With Text Language: Latin. Composed 1887/1900. Duration 40 minutes. Published by Serenissima (SA.Z2598). ISBN 9781932419184. 8.27 x 11.69 inches. This is an unabridged digitally-enhanced reprint of the vocal score that was prepared by Jean Roger-Ducasse and published by J. Hamelle & Cie. in around 1900. Measure numbers have been added along with a table of contents and instrumentation. The large format is extremely easy to read for singers, choruses and pianists. 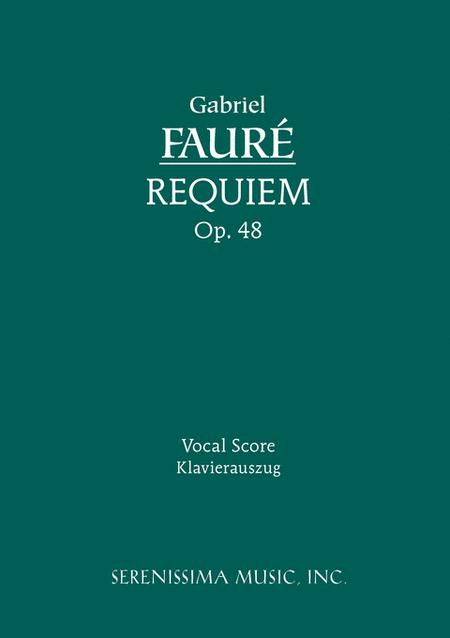 This is Faure's final version the Requiem. The accompaniment was expanded to full symphony orchestra from the original version for organ and chamber ensemble. It is the version that is by far the most widely performed and recorded.